As much of a work essential as that double shot latte, this draped cardigan is super soft with a new heathered knit that really ups the cozy factor. The relaxed, open-front shape plays well with everything else in your wardrobe. A piece that does the work for you. Made in NYC. Looser fitting with a waterfall collar. Hip skimming length. 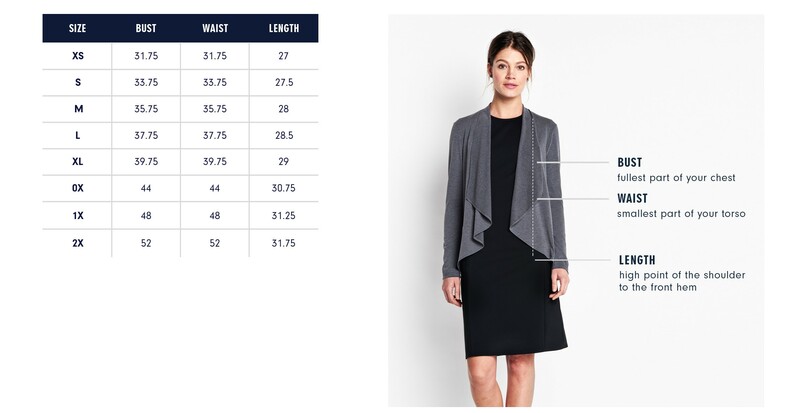 Our model is 5’10” and wearing a size S.
Below are the exact measurements of the Jackson Cardigan. All measurements are in inches. For general brand fit, sizing, and measurements, please visit our Brand Fit & Size Guide. Machine wash cold; line dry. Do not tumble dry. Dry clean. Looser fitting with a waterfall collar. Hip skimming length. This fuzzy knit from Italy is so cozy and has a beautiful weight, making it the perfect fabric for this draped collar cover up. Features: Slightly dropped shoulder. Asymmetric hem that dips at back.